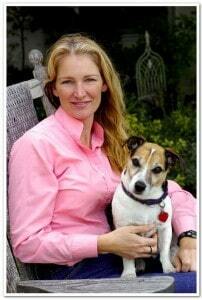 Q: Our dog has a pinched nerve in his back creating back leg weakness. We’re looking for treatment options. Pinched nerves are serious business indeed and once your veterinarian has had the opportunity to diagnose the degree of trauma and the location, there are many therapies that will help. Of course, one of the first things your veterinarian will want to do is get any inflammation under control, which may include medication. This is a crucial step, but there are other therapies that can help with this. Manual Lymphatic Drainage is a very gentle massage technique that supports immune function during inflammatory stages. You will want to find a trained specialist for this particular technique. Most massage will be contraindicated for the exact site of trauma, but generalized massage will be a helpful tool for pain management as well as relieving anxiety or compensatory muscle tension and supporting the immune system. Acupressure/puncture would also be recommended; it is an excellent tool for pain management. 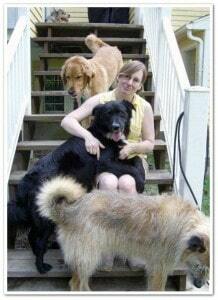 Again, you will want to find someone specifically trained in massage and/or acupressure for animals. You can check for practitioners in your area at www.nbcaam.org or www.nwsam.com or www.iaamb.org. Heat or cold applications can be overstimulating at this stage and should only be carried out under your veterinarian’s guidance; both can increase pain where nerves are involved. However, cold laser and microcurrent therapies can be used locally and have tremendous benefit for both pain management and healing. 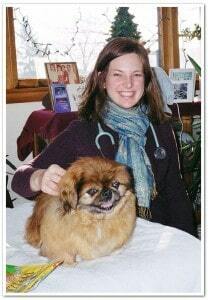 These therapies also require a trained individual and your veterinarian may be a good source for a referral. As your dog’s condition improves, more massage techniques and hydrotherapy can be added to help your animal regain movement and strength. 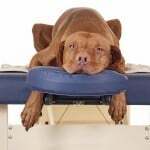 If the condition is related to a degenerative condition such as degenerative myelopathy or spondylosis, these therapies can still be valuable in managing the condition through its stages or even slowing the progression. 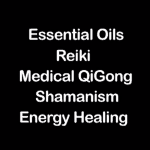 In the acute stages, I would also consider energetic therapies such as Reiki where healing energy can be directed to the site without contact. There are also Bach Flower Remedies or homeopathic products such as Traumeel, Zeel or Rescue Remedy that can provide relief. Use caution with topicals though as the dogs skin harbors lots of dirt and bacteria that you do not want to introduce below the skin. I like Rescue Remedy because you can give it orally or in the water or food and you can take it as well so that your own emotional response to your dog’s pain can be alleviated. I spoke with a vet (who stresses she is not a neurologist) who says while the gold standard would be to get an MRI to make sure there is no disc compression, massage would not be contraindicated for a pinched nerve, and may well help if it is a restricted muscle that is compressing the nerve. Fascia can also restrict nerves, and myofascial release would be another option to add to massage. Lastly, they may want to look into laser therapy to reduce inflammation. The newer MLS lasers are very promising. One option is acupressure. 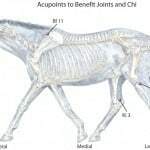 Acupressure has proven to be effective with spinal issues. Acupressure can be combined with physical therapy techniques. Suggested acupressure points to start are: BL 40 if the pinched nerve is toward the back of the dog, Bai Hui, GV 14, CV 12, BL 23, GV 20. There are more specific acupoints depending on the location, root of weakness, and level of weakness. Note about the products mentioned in this post: Traumeel and Zeel are manufactured and sold by the German company Heel Group who unfortunately were forced to discontinue their operations in the US and Canada. A new product, T-Relief, claims to be the same product, but many have experienced that it does not work nearly as well. You are still able to get Heel products on Amazon, or if you are traveling to South America or Europe, stock up! They are available there. That is definitely a question for your dog’s veterinarian. Will cephalexin help my dog with I think is a pinched nerve,I believe it’s from her vaccines, which was a week ago. She stiffens up around her neck then I’ll message it then she’s fine for a bit.